After 26 years of solo travel, I’ve developed my own unique list of essential travel items you may not find on other packing lists. Once you start using these international travel accessories, you’ll wonder how you ever lived without them! I hope you love these travel products like I do! Just so you know, I may get a small commission from purchases made using the links on this page at no extra cost to you. When traveling, I hand-wash my underwear and socks daily to extend the time between laundry days. Dr. Bronner’s soap is great for laundry and can also serve as body wash, shampoo, or even toothpaste in a pinch (I recommend the peppermint scent if you’re going to brush your teeth with it!). It’s organic, vegan, fair-trade, and biodegradable, and the scents are incredible — my personal favorite is almond, which smells like marzipan or amaretto. A little goes a long way, and one bottle lasts me several trips. In addition to Amazon, in the US you can usually pick it up cheaply in bar or liquid form at Marshalls. I always pack a stack of hand sanitizer wipes and keep a couple in my day pack when I’m out and about. They’re great for those situations when you really want to wash your hands but can’t, such as after eating greasy street food or using a questionable public toilet. These are unscented and so don’t leave a weird smell on your hands if you use them before eating. I buy this must-have for travelers cheaply in bulk on Amazon. When I’m crossing quite a few time zones, I take half a melatonin pill for several nights after arrival to recover more quickly from jet lag. I also take it on my return. Melatonin has been shown to be more effective at treating eastward jet lag, which matches up with my personal experience as well. Read what the experts at Harvard Medical School recommend about using melatonin as a remedy for jet lag. Of course, always consult with your healthcare provider before taking any kind of supplement. Listening to a white noise track on repeat is sometimes the only thing that allows me to sleep in the noisy environment of a hostel or Airbnb. I find white noise mixed with the ambient sound of rain very comforting and calming. A great cure for insomnia! Moo MiniCards are a great conversation piece and a fun memento to hand out to new friends on the road. I always get lots of oohs and aahs over these cute little cards! It’s easy to create customized cards using your photos, with contact details on the reverse. When giving a card, I usually fan out a selection to let the recipient pick their favorite. The matching card holder is indispensable. Click here to get 20% off your first order with Moo. 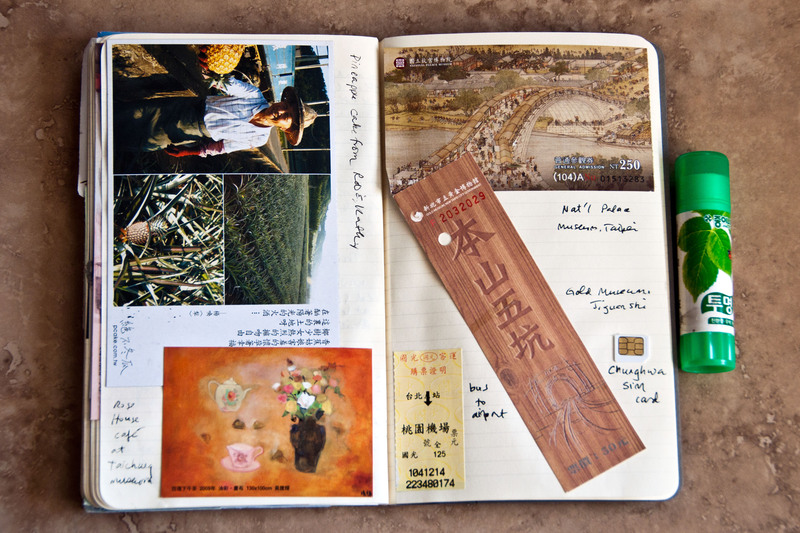 Moleskine notebooks have deservedly garnered a cult following for their design and quality. I bring one lightweight journal on each trip and write daily entries. I also use it to preserve the tickets and paper souvenirs I’ve collected, gluing them into the journal every few days as I travel to create a nice remembrance for later. This portable safe is a travel must-have. It’s a huge relief to be able to leave my valuables in an Airbnb or hotel room without worrying about them. In your room, lock the safe to something immovable like heavy furniture or a radiator. I use the 12-liter safe to store my laptop and DSLR with large zoom lens, but you may be able to use the five-liter safe if you have less. I also use it when I store my suitcase temporarily in reasonably secure locations like hotel baggage storage or a luggage locker. I place the valuables I don’t want to lug with me, like my laptop, in the safe, put it inside my suitcase, and lock the safe to the luggage handle with the cord extending from the inside. Since the cord is thin, the bag can be zipped almost completely shut. When I travel between locations I pack the PacSafe flat in my suitcase; it can also be rolled up. It’s light, doesn’t take up much space, and looks innocuous, so it’s not in danger of being stolen. I always plan gifts in advance for people who make a special effort, like my homestay families, language teachers, and volunteer guides. And I carry extras to give spontaneously to especially helpful Airbnb hosts and new friends I meet on the road. You can wrap the gifts ahead of time or bring small gift bags and tissue paper along, packed flat. E-readers are perfect for travel; they’re so much lighter than lugging a stack of physical books. I also love being able to check out books from my home library from anywhere in the world! The subtle front lighting of the Kindle Paperwhite allows me to read in dimly lit hotel rooms, and its non-reflective screen prevents glare in bright sunlight. It has great battery life too. Having a Kindle and Amazon Prime membership also gives you free access to the Kindle Owners’ Lending Library. As a travel book junkie, I have discovered quite a few interesting self-published travel memoirs in the library, in addition to some short fiction for Spanish learners. If you’re US-based and like Android phones, I highly recommend Google Fi, Google’s innovative low-cost phone carrier that covers 170+ countries. I’ve successfully used Google Fi in 18 countries on three continents over the last two years. Love crossing a border and having instant coverage. No more local SIM cards or roaming charges! US monthly rates consist of a flat fee of $20 for unlimited calls and texts plus data at $10 per gigabyte. Overseas rates are identical except that calls are 20¢/minute. Fi is currently only available to US residents. Fi now works on most Android phones and iPhones, although Google phones designed for Fi will likely offer the best experience. I currently use the 64GB Pixel 2 and love it; the camera is outstanding. If you’re interested in Google Fi, consider using this referral link, which will give us both a $20 credit. Have feedback on these travel essentials or more recommendations for must-have travel accessories? Please share your thoughts in the comments. So interesting, Ingrid! Some good ideas for my Argentina trip! What a practical and useful post! Thanks so much for stopping by, David! Abrazos a ti y a Vero!